The Community of Saint Luke seeks to be a nurturing, challenging community which values continuity as well as change, exploration and creative opportunities. A place where all who come are accepted and respected. A community ready to use the skills and experience of all its people. A community which values everyone’s freedom to search for the deep resources of the spirit, to make their own response and to find a fulfilling life. 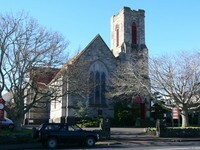 St Lukes Presbyterian parish was formed in 1875 to serve Remuera, Epsom and Newmarket. A wooden church which, had originally been a Congregational church on the corner of Remuera and Orakei Roads, was purchased and moved to the current site in the same year. The present church was built in 1931-32, using the plans of a church built in 1904 in the Scottish village of Twechar, near Glasgow. A complex of halls behind the church has served the parish and the community in a variety of ways for over a hundred years. In 1984, the renovated and refurbished halls were reopened as a community centre. The community centre and church interior were extensively redeveloped in 1998. Auckland City Brass: Christmas Across the Globe!